As an author, the name George V. Higgins doesn’t set off trip wires and alarms about all the classics he’s written. His fans love him though, love him for his bestselling crime novels that brought the darkness, reality and extreme violence and betrayals of the criminal underworld to life. I’d seen – but haven’t read – “The Friends of Eddie Coyle” and liked it. 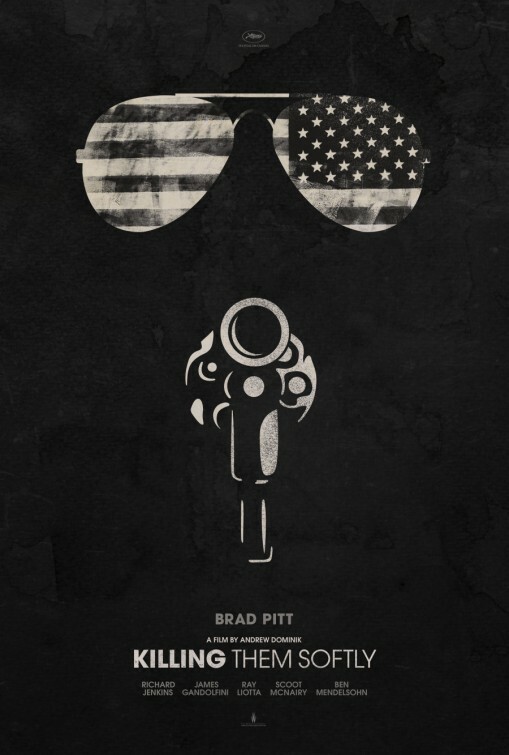 One of Higgins’ novels, “Cogan’s Trade”, received a big-screen adaptation recently with “Killing Them Softly”. 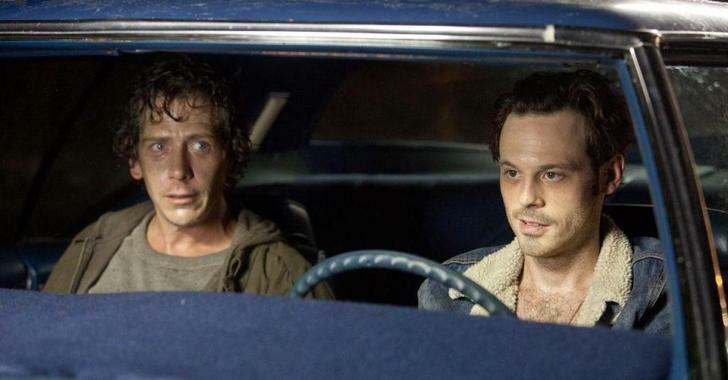 With the help of a businessman, Squirrel (Vincent Curatola), an ex-con, Frankie (Scoot McNairy) and a drug addict acquaintance, Russell (Ben Mendelsohn), have a plan to net some easy money. Frankie and Russell will rob a illegal high stakes poker game run by Markie Trattman (Ray Liotta), the owner of a ring of illegal games. In his past, Markie secretly took down one of his own games only to reveal it later, and Squirrel intends to set him up as the fall guy for his upcoming job. The actual robbery goes down pretty smoothly, but the fall-out is severe. 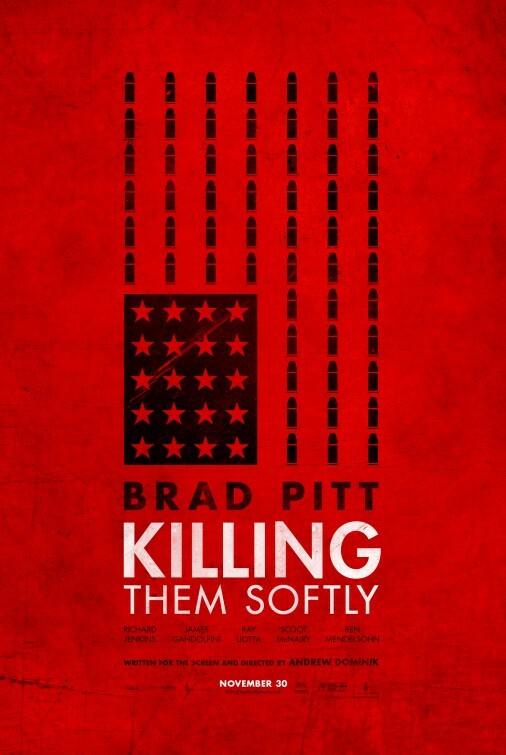 With mob ties to the card game, a feared enforcer, Jackie Cogan (Brad Pitt) is called in to handle the situation. He’s got to find out who was involved, who was behind it, and who’s lying to him. Brutality, intimidation, straight murder, Jackie isn’t afraid to pull out all the stops to find out what he needs to know and get paid in the process. What I liked most about this film noir-like crime flick is simple. Based off a novel Higgins wrote in the 1970s, “Killing” feels like those down and dirty crime dramas of the 1970s. There is a throwback feel to it that works on an effortless level. 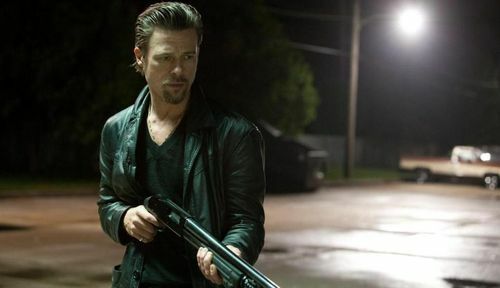 Some of the style, especially Pitt with his slicked back hair and duded up look, has that retro feel. Mostly though, it’s that ever-present sense of doom. In this criminal world as the movie presents, there is no hope, no light, no potential for happiness in the end. Anyone and everyone is trying to look out for No. 1. Betrayals, murder, backstabbing, all are fair game if it helps you get somewhere or something. That ultra-dark cynicism plays well. We know from the start that none of what we are about to see will go down smoothly. Blood will be spilled and money will be made, but at what cost? That sounds like it’s right up my alley, doesn’t it? An almost artsy feel of a 1960s/1970s French crime drama mixed with the tones of a barebones American crime drama from the 1970s? That’s got to be good, right? Well, it never amounts to much. This movie plays like a dirtier, far more foul-mouthed version of something Aaron Sorkin would have written. “Killing” is absolutely obsessed with dialogue. When written well, that can be enough to carry a movie, but the dialogue here gets tedious and serves no real purpose at a certain point. How many times can we hear Frankie and Russell talk about their sexual preferences before we just become numb to it all? I appreciate a slower, more character driven story that doesn’t focus exclusively on action, but it’s got to go somewhere. We get a long dialogue scene………and another………and another. An already short movie (in running time at least) at 97 minutes, it feels far longer, and I was using the fast forward option liberally. What ends up being the biggest waste here is the cast. There’s lots of dialogue here, but it feels like actors showing off but without any substance. Pitt is a bright spot (not a surprise) as brutal, quiet and effective Jackie, a man who has a special skill — enforcing/killing — and puts it to his advantage. McNairy and Mendelsohn are appropriately slimy while Liotta isn’t given much to do unfortunately as Trattman, a marked man. 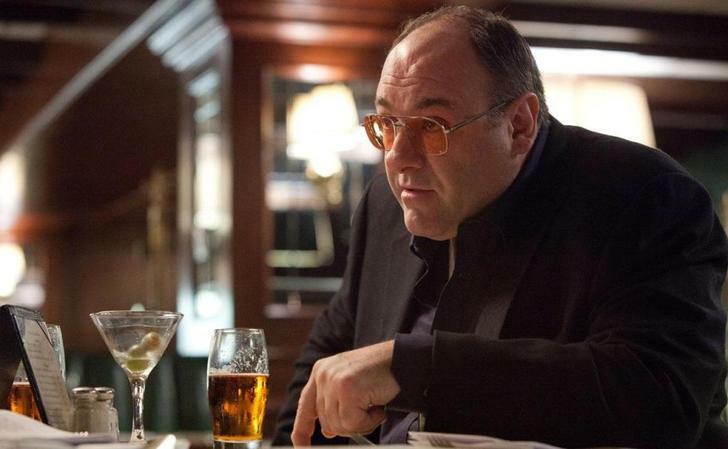 James Gandolfini plays Mickey, a down on his luck hit man who Jackie recruits for another job, hamming, whoring and drinking it up. Richard Jenkins is maligned and beaten down as Driver, Jackie’s link to the mob. Sam Shepard makes a bizarrely quick one-scene cameo as Dillon, an older enforcer with the biggest reputation around. The story itself has some flaws, but I think director/writer Andrew Dominik makes a really bad style decision. Any transition scene — car driving, men walking, whatever — has a voiceover being played over the visual. We hear George W. Bush and Barack Obama talking about the economic crisis in the U.S., country unity, working together. It all comes together in the end in the final scene, but it’s not worth the payoff we get. Instead, it comes across as a heavy-handed, obnoxious stylish storytelling device that handicaps the movie. As a film, it just can’t quite figure out what’s going on. Is it darkly funny? Just dark? A metaphor for something bigger, more profound? All of the above, none of it? If you’re going to tell a crime story, do it. Don’t get all mixed up in a message about America’s current economic state. Too bad overall. Lots of potential, and when it works in small snippets, it reminds me of a mix between “The Departed” and “No Country for Old Men”. Too often though it doesn’t do enough to give it a recommendation (even a mild one). Sorry to report I came away disappointed in a big way.